Once upon a time, some pirates, being good at pirating, had some treasure. There soon came a time when they felt the need to hide this treasure, so they hid their loot in some rather comfy and welcoming caves. Those floating skulls sure are hospitable! Why anyone would hide something in a place they couldn't safely go back to is anyone's guess, but Hannah sure doesn't mind! What an exciting change of pace from working in a tavern all day for terrible pay! So it's a good thing she's our intrepid hero. Hannah and the Pirate Caves is a pretty standard platform game. You, as Hannah, will need to collect all of the treasure and find the exit door to complete each level. Of course, it's not quite that simple: the caves are quite hazardous and require some care and concern for your well-being to safely pass through. At the top of your screen, you'll see a meter for your lives, the restart and quit buttons, your treasure count for the level, and your score. At the bottom there is a row of bubbles, which indicates how much air you have left if you're currently submerged in water. In the middle of your screen, there is action. The controls in Hannah and the Pirate Caves are simple and intuitive: all you need is the space bar and your arrow keys. Your left and right arrow keys will make Hannah run left and right, respectively, and the space bar will make Hannah jump. Pressing the up arrow key will make Hannah look up, and pressing the down arrow key will make Hannah look down and/or crouch so she can crawl through tight spaces. Monsters don't do anything special - but you need to avoid treating them like a race ribbon! They come in the forms of Pawkeets, Mirgles, ghostly Gelerts, skulls, and robotic primates. They can all be avoided by jumping over or ducking under them. There are six tutorial levels and twenty regular levels in Hannah and the Pirate Caves; that's a lot of treasure! Each level has an image of the gem location and a written walkthrough. Tutorial 1Start the level and play as the parchment popups instruct you to. To get the gem, you'll want to fall down the gap between the last big jump, before the last set of treasure. Hop over the solitary boulder next to the ladder, and push it left to break the wooden platform below. Follow the boulder down and enter the secret area through the broken platform. Go right, collect the gem, and then head back left as far as you can go. Climb up the ladder and make your way back to finish the level. Tutorial 2Play as instructed. To get the gem, jump off the platform where the last four treasure chests are, and into the wall. Go left, collect the gem, and head back and finish the level. Tutorial 3Follow the parchment instructions until you're told to run across the platform as the boulders fall. Just ignore it, and wait until all the boulders have fallen. They'll form a set of stairs - run up and through the secret area. Collect the treasure and the gem, and then fall down to collect the last set of treasure. Exit the level. Tutorial 4Run around as you're instructed. After you blow up the second dynamite crate, the one above you, fall down the gap and jump into the wall on the left to enter the secret area and grab the gem. After collecting, head back right and finish the level. Tutorial 5Follow the parchment instructions. To get the gem, jump over the exit and then jump up into the secret area on the left and collect the gem. If you walk into the square the gem occupied, you will fall down, which will not kill you, but you'll have to swim your way back to the exit, so stop just short of the square, and then run back right and finish the level. Tutorial 6The pirates apparently chickened out and didn't hide a gem in this level. Play the level as guided. Level 1Jump to the left, over the spikes, into the wall. You'll fall into the secret area. Run right, collect the gem, then head up the ladder. Crouch down and head left and down where the treasure is - be careful of the Pawkeet! Collect the treasure on the wooden platform a little further to the left, too, and then head back right and collect the treasure in the little cove. Hop up the platforms to get the treasure at the left. Head towards and past the exit to grab the last treasure and exit the level. Level 2Go right and into the water, being careful of the spikes. After the second "dip", head down and left into the wall. The secret area is right above the spikes - go in and collect the treasure, and then make your way back. Go to the far right and collect the treasure. Hop onto the platform, hit the arrow, and quickly make your way onto one of the left-side platforms. 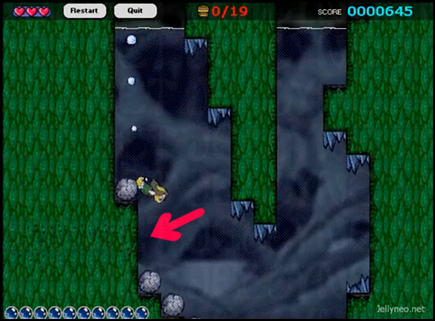 Collect the treasure on the bottom platform as the boulder falls, then follow the boulder down. Collect the treasure. If you want the extra life, break the crates, go up for air, and then swim down the tunnel and grab the life. 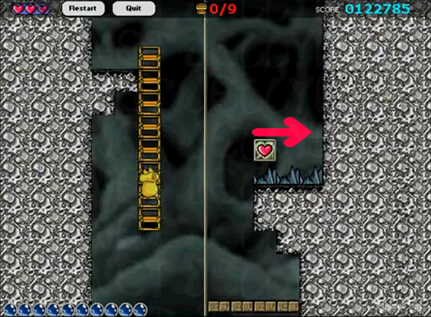 Go back up and hit the arrow accessible from the top left-hand platform. Wait for the boulders to fall, and then head back to the left. Collect the treasure up the ladder, and finish the level. Level 3Head up and into the tunnel to the right. Collect the treasure, head back, and climb up the ladder as far as you can. Go right and then down; ignore the ladder going up when you hop off the first ladder. Collect the treasure at the bottom, and then wait, and maybe pet your cat while you wait some more, for the water to catch up to you. 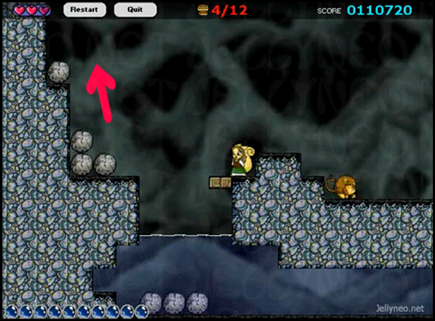 Hit the arrow once the water level is high enough, and then quickly move out of the way to avoid the boulders. The air pocket to the left is a good place to wait. Once the boulders have fallen, go up the passage and climb the ladder. Run left, collecting the treasure as you go, and then head down - be careful of the Pawkeet! Hit the arrow and collect the treasure, and then go further left. 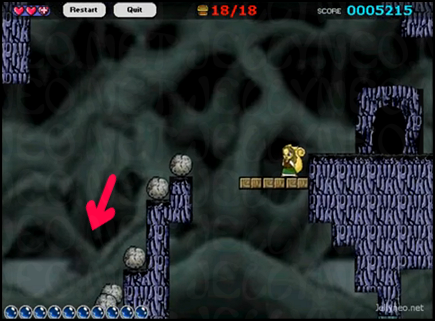 Hit the arrow near the exit, collect the treasure at the end of the platform, and wait for the boulders to fall. At the top of the column a treasure will be sitting - grab it. 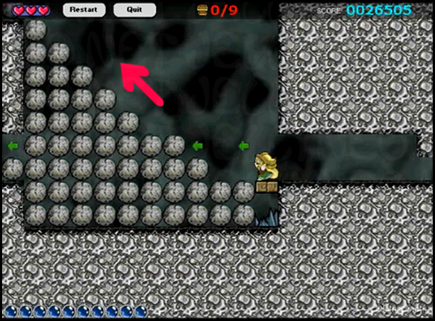 To collect the gem, drop down the secret area to the bottom left of the boulder group and the spike. Go left, and then head back and go up through the platform. 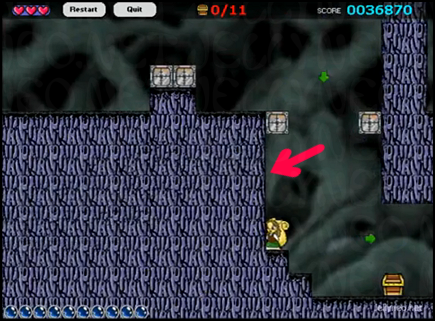 Swim up past the ladders and head into the exit to the right to finish the level. Level 4Go left, jumping over the Mirgle when he gets in the way, to collect the first treasure. Keep going left to collect another treasure and trigger the arrow. Boulders will fall and break the platform - an arrow crate will rest on top of the middle boulder. Head down and set it off from the side, and then go right, collecting the treasure, and jump onto the wooden platform. The Mirgle will hopefully be trapped on the other side of the boulder, but if he's not, just be super careful. Use the boulder as a jumping point to hit the arrow. Wait for the crates, and more crates, to fall, and then jump onto them to reach the last set of treasure on a platform to the right. If you want the gem, head back left to where you triggered the first arrow, and jump onto the boulders and platforms to reach the gem at the very top. 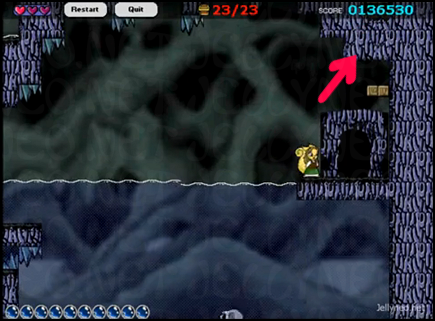 Head back right - you may want to go underneath the ground where the Mirgle is to easily avoid him - to exit the level. Level 5Jump up the platforms and climb up the ladder and jump up more platforms, being careful of the Mirgle and Pawkeets. You'll pass an extra life on the way - you can get that later! For now, just wave. Push the boulder at the very top to the right, and then to the left, off the ledge. Follow it down, again being careful of your enemies. Push it to the right and follow it down once more. 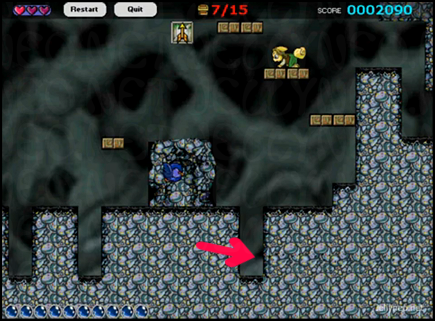 Collect the treasure at the bottom after the boulder breaks the platform. Head back up, and wait at or near the ladder where the extra life is. Wait for the water to rise and swim over to it. If you want the gem, go further right into the secret area in the wall. Fall down and collect the gem. Go right to the platform, and jump up to get back into the level proper. Keep going up, being mindful of the dangers, and exit the level. Level 6Follow the tunnel down and right, and hit the arrow at the bottom. The arrow will hit another arrow crate, setting loose another arrow that will hit yet another arrow crate, so be prepared to jump over the arrows. Once the crates have been set off, head right into the water. Be careful of the floating skull! Collect the treasure to the far right and in the pool near the tunnel to the other side of the level. Once done with the right side, crawl into the left side, and collect the treasure there. You'll have to wait for the water to rise up to get the one on the platform. To get the gem, head back into the right side, and hop up onto the platform above the exit. Keep jumping up and then head left. Grab the gem, and then follow the path you started on. Swim towards the exit and finish the level. Instead, head into the wall to the left. Crouch down and push the boulder over the spikes. Swim up, collecting the treasure, and hit the crate to set the arrow crate free. Hit it from the top, and head right and up, detonating the dynamite crates as needed. The second dynamite crate must be hit from the left side! 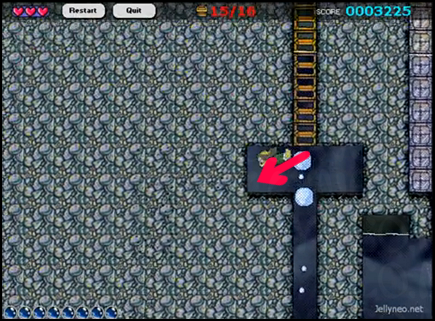 Head to the left, and jump over the spikes onto the boulders, and then onto the platform. Run up the set of boulder stairs. Drop into the ditch to collect the treasure, and then hop back up and left. Fall down and trigger the arrow, and wait for the creates and boulder to fall. 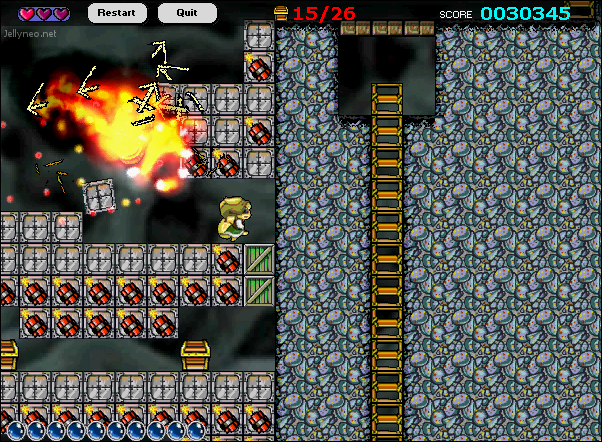 Carefully break each of the crates, and then push the boulder left to break the platforms. Swim down and to the exit. 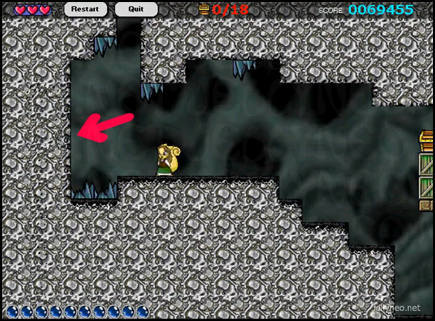 Level 8Jump left, over the boulder, and push it to the right to cover the spike-filled ditch. Hop onto the platform, collect the treasure, and break the crate to drop the dynamite. Detonate it from the right so it jumps left and blows up the platform. Head down into the newly-freed space and set off the arrow. Head back up and then right as far as you can, being mindful of the Pawkeet, and head up the ladder. 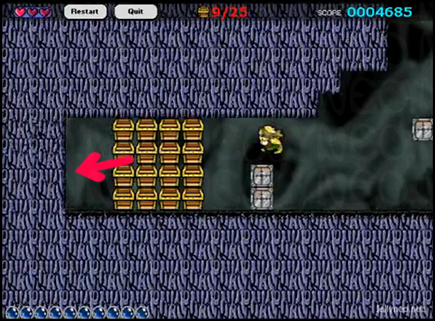 Jump off to your left about halfway up and collect the treasure, and crawl into the secret area in the wall. Jump over the gap, collect the extra life, and then head back to the ladder. Go up, and then head right, where the Mirgle is. Jump over him to collect the treasure, and then head back left, pushing the boulder with you. Drop down with it, but abandon it for a second. Head right and trigger the arrow, and then go back up to the boulder and reassure it that you haven't forgotten about it and that it still has a purpose: push it right to break through the platform. 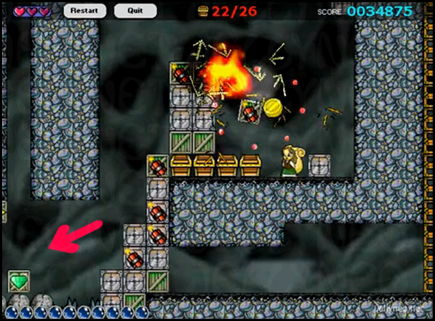 Collect the row of treasure going left, and set off the arrow and wait for the crates to blow up and fall. Jump to the bottom and then work your way up, setting off the dynamite as necessary to get your treasure. Then, make your way to the ladder on the left, and go all the way down. Break the five crates, being careful of the metal ones that will fall, and then head back up. Use the air pocket when you need to. 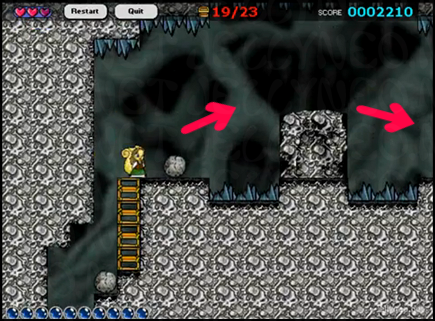 To get the gem, enter the secret area at the bottom left-hand corner below the ladder, and crawl over to the arrow. Quickly head back to the air pocket to wait for it all to blow up, and then collect the gem and exit the secret area the way you came in. Go up the ladder, and you'll see the crates you broke formed a small ditch with a treasure at the bottom. Collect it, and then go down and right. Be careful of the skull. Head up the ladder and finish the level. Level 9Jump off your platform to the left, over the spikes. 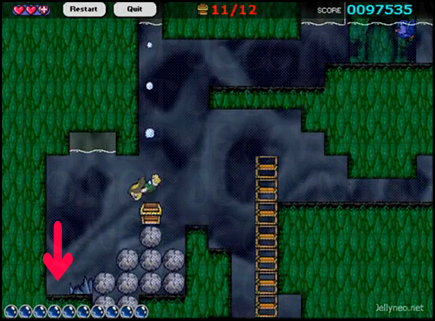 Get ready to gogogo - hit the arrow, and then jump up the platforms and onto the ladder quickly to avoid the falling boulders. Jump onto the crate, using the bounce to propel you to the terrain to the right. Jump onto the next crate and use the bounce to attach yourself to the ladder. 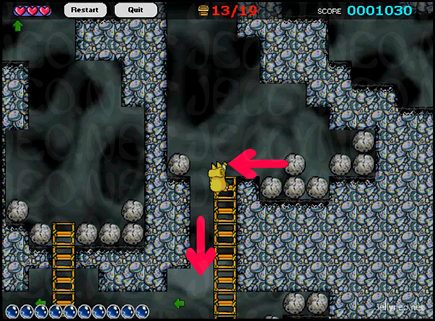 Move across the three ladders and break the crate on the platform and quickly get out of the way to avoid the boulder. Fall down where the boulder broke the platform, and head onto the next platform. 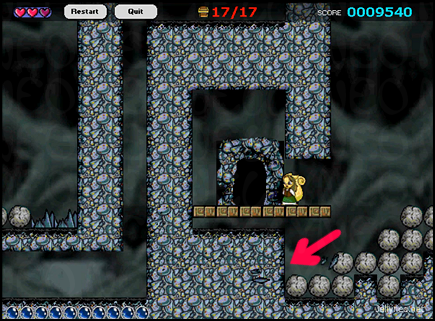 Collect the treasure and push the boulder to the left to break the platform. Follow it down. Jump left off the ladder about halfway through and bounce off the arrow crate. Fall to the left, and swim down into the pool to collect the treasure. Enter the secret area in the wall to the right and swim up. 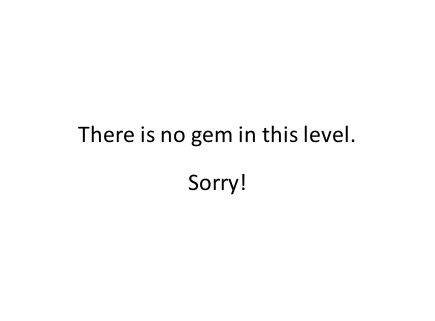 You'll see an arrow at the top, but you can't hit it, so the gem is not available to collect. Head back down and up, and carefully swim to the right over the spikes. Hop onto the boulders, collect the treasure, and finish the level. 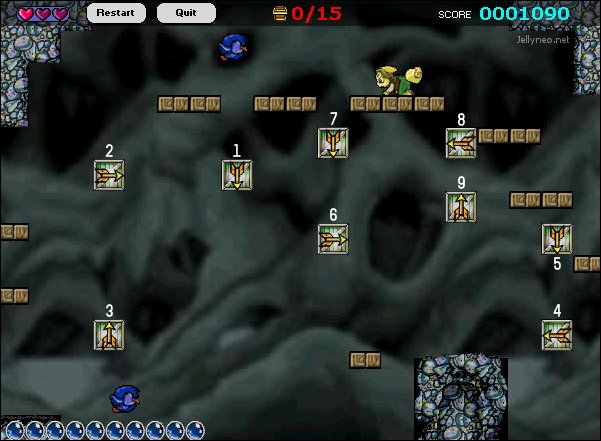 Level 10Move down the ladder to the right to collect the treasure on the bottom platform, and then climb back up to the top. Hit the arrow and wait for the boulders to fall. Hop onto the boulder and break the crates one by one and collect the extra life by jumping. Head to the left, collect the treasure, and walk over the metal dynamite crates. Stop under the breakable dynamite, and then quickly jump up and right to avoid the immediate blast, and then jump left towards the wall to avoid being hit as the metal crates blow up. Take a deep breath, and hit the arrow. Quickly jump onto the platform and collect the treasure on the platforms above it, making sure to collect every treasure between the stacks of metal crates. Once you get them all, head up the ladders and prepare to do it again: hit the arrow next to the treasure on the terrain, and quickly race to the right. Collect the treasures and wait next to the door. To get the gem, wait for the boulders to fall, and then jump left over the ditch. Go down, landing on the boulders as you go. When you get to the break, next to the tiny bit of platform left, head right into the crawlspace and push the boulder on top right. You can finish the level without doing this, but this will help prevent accidentally blocking your way later! After you deal with the boulder, head back left and go down. You'll land in some water. Head all the way left, and climb up the ladder to collect the gem. Go back right and push the boulder as you go. You may need to head back for air. Once the tunnel is cleared, keep going right. Break the crates and head up the ladders at the start. Run over the boulders, and carefully jump over the spikes, a task made easier by moving the stray boulder on top earlier. Then keep jumping up and right, and finish the level. Level 11Head onto the wooden platform above you, and push the boulder on it to the left until it falls through the platforms. Follow it down, and set off the arrow to the left. Step out of the way to avoid being crushed by a heavy rock! Push said heavy rock to the left through the little tunnel. Jump up and hit the arrow, then head right and up the ladder. Set off the arrow. Go down and back right to collect the treasure in the two pools. Make your way left again as far as you can, and climb up the ladder. Jump off of it, over the spikes, onto the other ladder, and jump off of that one past the spikes. Go down, into the water, and set off the arrow crate from the side! If you set it off from the top it will hit you. Move out of the way and wait for the metal crates to give you a boost to reach the ladder. Move left across the ladders until you're at the top of the last one, and jump up to break the crate. Allow the arrow crate to fall, and jump off the ladder onto it to set it off. Head back right as far as you can, and swim down into the pool - be careful of the skull! Move the boulder to the left until it falls. You'll see another boulder as you go - push that one left too, to break the spikes. You'll want to push this boulder two or three steps at a time, and then get out of the way to avoid the skull. Use the air pocket when you need to. Head left into the wall to access the secret area. Once you're done falling, collect the gem, and then step to the right to fall back down. There's another skull down here, near the air pockets, so after you fall, stop! If you stay still in the air pockets, the skull won't hit you. Once you're in the clear, head down and collect all the treasure. If you want the extra life, break the crates and then move the boulder to the right to break the platform. Then carefully swim down and through the passage to collect the extra life, all the while hoping you'll not have to automatically redeem it like I did every time I tried to get it. Back into the main pool, make sure you're full of air, and then move through the channel to the right, breaking the crates as you need to. You'll want to go quickly, so you don't run out of air, but keep your pace controlled so you don't run into spikes. At the platform, you can either swim through it or blow up the dynamite crate, and quickly head up to safety and air. Then head right, up the very first ladder, and left to the exit. Level 12Simply set off the arrows in the order the image below describes. Collect the treasure in order so you don't block yourself later. Be careful of the Pawkeets, of course! Once you get all (or most, as I've done in the video) of the treasure, slip into the gap on the right side of the exit, and crawl right to set off an arrow. Head back, collect the gem and any remaining treasure if you've got it, and finish the level. Level 13You'll need to be speedy during this level, as the water will rise up and make it difficult for you to play if you lag behind. You may want to look at the map before you start the level to get an idea of where you'll be going. Head left into the first cove and collect the treasure there. 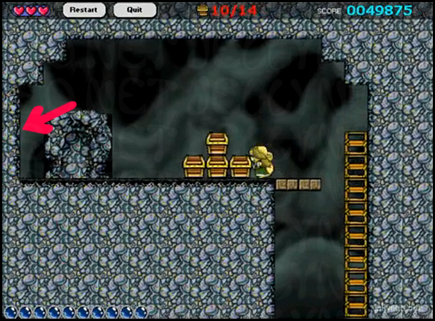 Head back right and go up the two ladders, and collect the treasure to the sides. Once you're off the ladder, follow the tunnel. Go past the ladder and get the treasure, and then head back right and go up. Follow the path, and then use the first ladder to go down. Collect the treasure, go back up, and left past the second ladder to collect the treasure. Crawl through the tunnel and start heading back up. 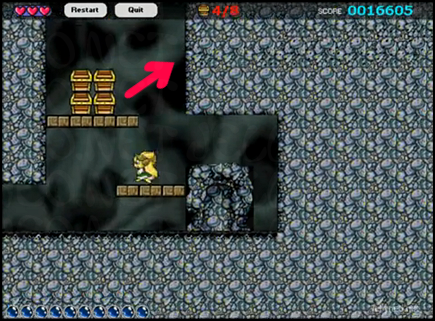 Push the boulder right to break through the platform, and collect the treasure there. If you want the gem, make sure you're at 19/23 treasure chests collected, and head left. Crawl through the tunnel, pushing the boulder with you, but don't collect the last set of treasure in the nook it falls into. Instead, jump up and follow the "stairs" and up the ladder. Be careful not to move the boulder at the top, near the exit, to the right! Jump over it, and over the pits of spikes, and crawl into the wall into the secret area. You'll fall down; run right, over the gap, and set off the arrow. Crates will fall and fill the gap, and a gem will be perched on top of them. Collect it, and then run left. You'll drop down into passages full of water. Swim to the nook that contains the last treasure, and collect. Use the air pocket if you need to. Then head back up to the ladder. 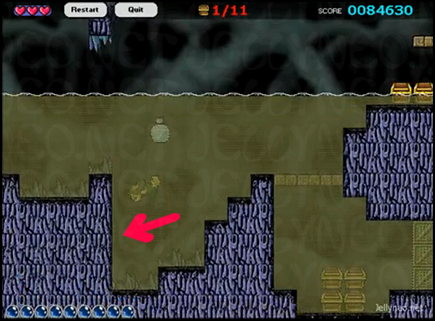 The extra life is all the way at the bottom of the level, so push the boulder to the left and follow it down. Repeat as many times as you need to. Then swim around, break crates, and collect the extra life. Once you've gotten it, you need to wait for the water to rise up, which can take a while, so twiddle your thumbs or pretend you're a fish or chew gum. Let the water carry you up through the tunnel, and then hop up once you can get your footing. Climb up the ladder, jump over the spikes, and finish the level. Level 14Head left and down the ladder. Move the boulders at the bottom to the left - you'll have to jump over them before moving. Be careful of the ghost Gelert! You can crouch down to escape his wrath. Once all three boulders have been settled into the gap, jump up and break the wooden crate. Set off the arrow from the left side. Scramble up the ladder, and start moving to the right. Set off the wooden dynamite crate to blow up the metal crates. Collect the treasure at the top and keep moving. Jump over the gap, hitting the arrow crate as you do so, and wait for the crates to fall. To get the gem, you'll have to be speedy: jump on top of the arrow to set it off, and then run after it. Collect the treasure and then quickly head back for the gap and crouch down. Wait until the three arrows pass over you, and then head back right to collect the gem. Make your way back to the left and exit the level. Level 15If ever there was a level designed solely for the use of your extra lives, this is it! A combination of speed, great timing, and luck is needed for this one. Start by heading down the ladder to the left, jumping off onto the platform about halfway through. Set off the arrow and head back up to where you started, but don't stop - keep going right. After the two arrows are set off, jump over the gap to the little ledge. Wait for the boulders to fall, and then follow them down. Crawl to the left and jump over the spikes. Set off the arrow, and then head back over the spikes. Some more boulders will fall; follow these as well, and then dive right into the pool of water. Head into the wall below the first boulder to access the secret area. The gem is at the far left end of the pool, so swim around and over the spiky bits of terrain to get to it and back. I find that by going in a more exaggerated up-and-down motion, I swim faster; it's easier to run into spikes this way, however. Once you're back into the main pool, head up the passage to the right. Jump up through the platform, setting off the arrow, and then quickly jump onto and up the ladder. Try not to get your tail singed like I did. :( Set off the arrow to the right, collect the treasure, and then scurry back left and up the ladder. Jump off of it to the left before it's all blown up, being careful of the robot character. Collect the treasure, and do the same on the leftmost platform. Fall down the gap, and then down the next gap at the bottom. Crawl through the tunnel and fall down yet another gap. Jump over the last (I promise!) gap, collect the treasure, and then take a deep breath. Fall onto the arrow crate, and then superspeed to the left! Jump onto the ladder before the arrow following you plants itself in your back. Run up the ladder as the dynamite blows up right behind you, and jump right to safety. 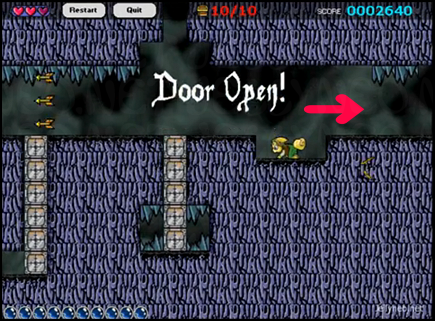 Collect the remaining treasure next to the exit door, and finish the level. Level 16Collect the treasure at the left, and then go up (and up and up) the ladder. Collect the treasure above the platform, and climb up the ladder next to it. Jump onto the platform and collect the treasure, then jump onto the platform above and set off the arrow. Quickly make your way back down - falling down the gaps is fastest - and run left across the "ground" of crates, collecting the treasure along the way. Keep going, breaking crates and collecting treasure as necessary, until you hit the stone terrain. Stay in the corner and wait for everything to settle down. Carefully set off the dynamite and collect the treasure along the bottom. Step down the set of crates and jump over the spikes to grab the gem. Set off the arrow to get a way out, and then head right. If you don't want the extra life, you can exit now, but if you do, head back up the long ladder and the short ladder. Jump up the platforms to the top and collect the extra life. Dive off the ledge, making sure you stay somewhere in the middle of the screen so you don't blow yourself up, and miraculously land without shattering. Head to the exit to finish the level. Level 17Break the crates to your right, and then set off the arrow from the top. Wait for the dynamite crate to blow up. Poke through the newly-made gap and go left. Wait at the first cove for the water to lift you up, then grab the treasure and swim back down and left. Pass the next cove and collect the treasure on the platform to the far left, and then swim back and collect the treasure from the cove. Head back left and go up. Collect the treasure in the cove to the left, and then the right. Say hi to the gem while you're there, but make it quick - you'll see him again soon. Swim back out and hit the arrow above you. Quickly dart up for air and then hide out in the cove to the left. Collect the treasure while you're waiting for the boulders to fall. Push any boulders blocking you out of the way, and then make a mad dash up for air. Head down to collect the last treasure, and then follow the tunnel to the right. 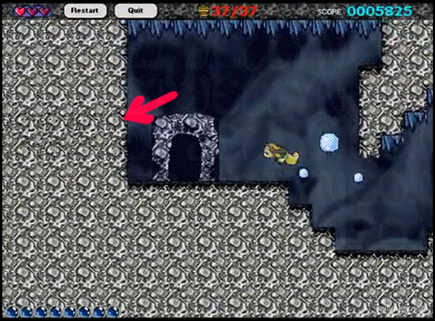 Swim into the wall over the exit to access the secret area and then gem. Pop back out to finish the level. Level 18Head down the ladder, being careful of the Pawkeets at the bottom. 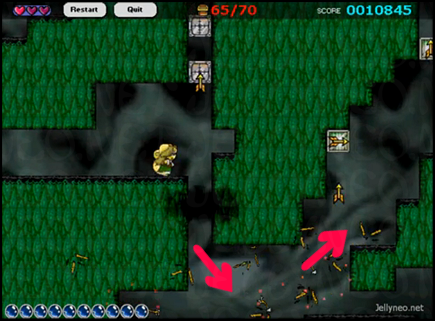 Move left off of the platform, and collect the treasure at the far right. Head back up to where you started. Head right and swim over the gap. Be careful of the Pawkeet. Move further right and set off the arrow in the pool. Collect the treasure that falls - you may need to replenish your air supply before you can do this. Head up the ladder, collecting the treasure on either side, and then keep going up. Be careful at the top, since a floating skull patrols the area. Crouching on the wooden platform will keep you safe. Head right. Keep an eye on the ghost Gelert and the Pawkeet, and drop to the bottom when it's safe. Push the boulder to the right to break through the platform. Navigate onto the second wooden platform, the one the ghost Gelert hovers over, and put yourself on the right side of the boulder. Push it left, and then right to follow the first boulder. Hop up onto the ladder. Jump off to the left, setting off the dynamite. Push the boulder to the right. Jump onto the arrow crate to set it off, and collect the treasure. Leap into the wall past the treasure to enter the secret area. Use the "stairs" to jump up to the gem, and then go down. Swim right and up again, being careful of the Pawkeet and the skull, and make your way down past the platforms. Push the boulder into the gap, and follow it down. Exit the level. Level 19Move the boulder directly below your starting point to the right, and then crawl behind it to push it right again. Do the same for the boulder that was right next to it, and then the boulder above. Collect the treasure sets as you go along. Once those three are settled on the terrain next to the wooden platform, start working on the right side. Push the leftmost boulder at the top ledge to the left, and follow it down to push it right. Head back up to the ledge and push the other boulder left and then right. The boulder in the C-shaped nook you can leave alone. Again, collect the treasure as you go. Fall into the gap, and then head right to collect the treasure. Don't stop, or the boulders will crush you! Once they've fallen, jump on top of them to start heading to the left. Collect the treasure and go down the ladder. Jump up the platforms and grab the treasure. Set off the arrow at the top, and then skedaddle to the left side of the platform. After the first boulder falls, follow it down quickly. Wait until all three boulders have fallen, and then head down. Collect the treasure in the gap, and make your way to the right. Climb up the ladder to the first platform on the left. Push the boulder right off of it, and then follow it down to push it left five more times. Head back up the left ladder and push the boulder on the second ledge off. Climb up again, and jump over the boulder on the third ledge so you're standing on the right side of it. Push it left. Time for the right side! Climb up the ladder to the very top, and hop onto the platform. Push the left boulder off to the left. Follow it down, and push it right twice. Head back up the ladder and push the boulder on the first platform off. Do the same for the boulder on the third, and then make your way back to the top platform. Push the boulder to the right, and then make your way down. Collect all the treasure, being careful not to block yourself with the two boulders. Head left and down, collecting the treasure as you go. Set off the arrow crate, and wait for one arrow to fly up past you. Quickly jump down and onto the terrain block. Jump up to the right and detonate the arrow. Head down and collect the treasure in the cove. Jump back up to and collect the gem before the boulders block or crush you, and pick up the last treasure at the floor. Exit the level. Level 20Head down and set off the arrow, and then quickly bound up and onto and around the platforms to collect all the treasure, going right and then left and then right again onto the terrain. Try not to get hit by a boulder! Once you're past the platforms, wait for a couple boulders to fall onto the spikes, and then start moving. Drop onto the ledge after the first boulder falls, and then onto the next after the second, and the third ledge after the third boulder (unless you're feeling particularly reckless like I apparently was). Fall off the third ledge onto the terrain and wait for the dynamite crates to blow up. As soon as they do, run across the wooden platform, drop, collect the treasure, and wait by the exit. You could finish then and there, but if you want the gem, wait until all the boulders fall. Head down underneath the platform and into the secret area by walking into the wall. Go left. Hop up each platform until you get to the top, and then run right to grab the gem. Head back and fall down alongside the platforms, landing once again without breaking bones. Run back to the right to finish the level - and the game! The most useful advice a person can get regarding Hannah and the Pirate Caves: get the gems! Don't slack off. They're worth a whopping 5,000 points once you finish the level. Doing the tutorial levels is good for points too. With both the tutorial levels and the gems under your belt, the 150,000 you need for the avatar can be obtained by level eight. If you're aiming for a higher score, say for a trophy, you'll need access to all the levels. So run through the game a couple times, practice the levels you tend to get stuck on. Then set aside a good amount of time to be able to run through the entire game. You can get a higher score by purposely failing or restarting some levels, since some of the points earned from destroying crates and collecting treasure add up as you play, not at the end of the level. I like levels ten and nineteen for this, although fifteen isn't bad for it either.